A new film studio proposed for an old warehouse complex in the Lower Garden District won an important step in the process of city approval Tuesday, over the concerns of several planning commissioners who worried that the site could one day be home to heavy industry. Sam Farnet, owner of Joey K’s restaurant on Magazine Street, is seeking mixed-use zoning for a warehouse complex at the corner of Constance and Orange streets that he says he hopes to transform into a film-production facility, though he has not yet finalized negotiations with a tenant. 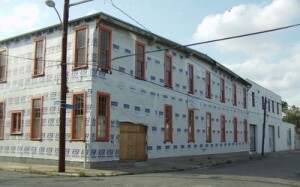 The surrounding neighborhood group, the Coliseum Square Association, said in March that they trust Farnet as a developer, but are concerned that if his project falls through, a less-desirable project allowed by the mixed-use zoning may open in its stead, such as, they noted, a chicken slaughterhouse. The planning commission had postponed a decision on the question for a month in order to give Farnet and the neighborhood more time to reach a compromise. Farnet said later that he had met with the association’s president a day before Tuesday’s planning meeting, and that they decided to seek another extension on the decision, but were told the project deadline was looming and had to be handled at Tuesday’s meeting. Because the commission had already heard from Farnet in March, he was not asked to speak before the commission Tuesday. Instead, commissioner Louis Volz opened the discussion of the matter by recommending denial of the project. “The MU-A [zoning] is way too intense,” Volz said, describing other allowed uses within it: medical-equipment manufacturing, research laboratories and auto body shops. Volz also noted that the inherent conflict of a good idea that requires otherwise inappropriate zoning is one that the planning commission often has to decide. At the other commissioners’ questioning, planning staffers said that the somewhat-lighter commercial zoning would also allow a movie studio, but would require a conditional use (which Farnet said Wednesday is a separate process entailing an additional six-month delay). Without further discussion, the vote was called, and the commissioners overruled Volz in Farnet’s favor by a 6-3 vote. Farnet, who attended the meeting, said in an interview Wednesday that the commissioners’ vote in his favor surprised him after Volz’s comments. “Obviously, they looked at it a little differently than he did,” Farnet said. The conversations with the neighborhood association were friendly and productive, and Farnet said they could continue as his zoning request now moves to the city council. Meanwhile, Farnet said structural renovations are continuing inside the building, though work on the exterior has been halted at the request of a potential tenant that has different ideas for the facade. Negotiations with that tenant are ongoing, Farnet said. Farnet’s request occupied only a small portion of Tuesday’s meeting, which was dominated by two other matters: zoning changes to allow a proposed beauty salon on Lapeyrouse Street in the Seventh Ward and to allow alcohol sales at Sukho Thai in the Marigny. The beauty shop was granted despite neighbors’ concerns about parking impacts, but the restaurant’s request was denied on the grounds that the owners should have considered the inability to sell alcohol in their decision to open in the Royal Street location. Also on Tuesday, with considerably less discussion, the commission granted approval for a Subway sandwich shop near Walmart in the River Garden development and rejected a city council request concerning zoning around the Lafitte Corridor. To read our live coverage of Tuesday’s meeting in its entirety, click “Replay” in the box below.